Anthropologist Anders Burman talks to Don Carlos, an Aymara shaman in Bolivia. According to Don Carlos, people are ill from Colonialism and in need of a cure. “In contemporary Bolivia, the concept Colonialism is used so frequently, and with such distinct connotations by such a diverse set of actors that it demands scrutiny", the Swedish anthropologist writes in his paper Colonialism in Context An Aymara Reassessment of ‘Colonialism’, ‘Coloniality’ and the ‘Postcolonial World’ (pdf) that was published in the recent issue of KULT on postkolonial.dk. Colonialism is according to Burman on the one hand considered a sickness and on the other hand the source of sickness. Most notions of illness held by Aymara shamans find their equivalents in notions of Colonialism. As illness, as lived experience and as collective memory, Colonialism is still present in the Andes. To the indigenous peoples in Latin America it is a question of continuous Colonialism; the colonialists have not left. Although the Spanish colonial administration no longer holds power over their former indigenous subjects, Aymara people of the 21st century are subalternized and impoverished in a global system that still has colonial traits according to Burman. Evo Morales’ victory at the polls in December 2005 did not change that, the researcher writes. There is an imminent risk of the new regime being “infected". Burman has written a dissertation about this topic. KULT is a postcolonial special issue series. It began in 2004 as the result of a desire to connect a series of discussion fields about postcolonial Denmark. 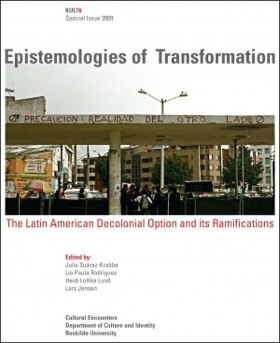 The recent issue on Contemporary Latin American epistemologies has grown out of a network of Latin Americanists in Scandinavia and the Americas. As a corridor between the academy and the Political Society, decolonial thinking is transdisciplinary (not inter-disciplinary), in the sense of going beyond the existing disciplines, of rejecting the “disciplinary decadence” (Gordon 2006) and aiming at un-disciplining knowledge (Walsh et. al 2002). Hence, decolonial thinking in the academy has a double role: a) to contribute to de-colonize knowledge and being, which means asking who is producing knowledge, why, when and what for; b) to join processes in the “Political Society” that are confronting and addressing similar issues in distinct spheres of society. Why was anthropologist and indigenous rights activist Miguel Ángel Gutiérrez Ávila beaten to death? Thanks for the link i found some other informative articles there. I’m glad to see clear statements that illustrate the myriad ways in which colonialism is still alive and with us all in one form or another. We in the well-off north speak of progress and development when the world is still defined by the legacies and mechanisms of colonialism. It is absurd. Aime Cesaire pointed out that colonialism not only effects the colonised but also the coloniser. He claimed it was colonialism that gave birth to Nazism. A corruption of the colonisers soul but also a more straightforward transfer of colonial policies to European society. It was only then, when ‘white’ society was under attack that the world stood up against the racial hierarchy and murder of colonialism. Alas he was wrong about the last part, because the world only stood up against racial hierarchy to a point. On the other hand i think he was right about how the ways a society treats other societies will boomerang back on them. The West’s pursuit of capital accumulation and nationalist industrial competition at the expense of social development for all, for me, feeds the ways our Euro-American societies have become. Decayed, stressful and on a road to ruin.